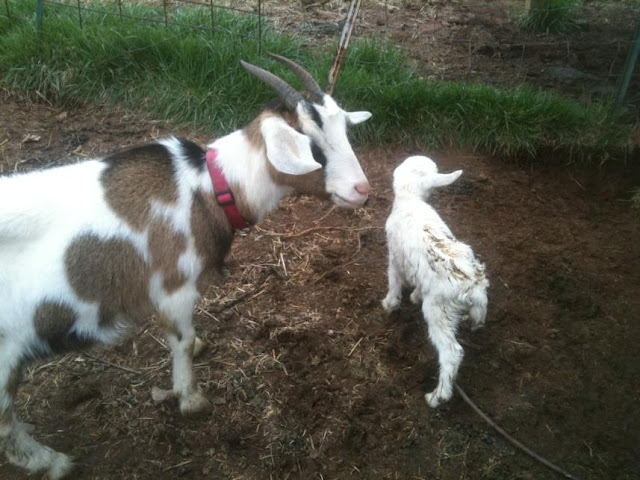 Frugal Fashionable Farmer: Eli & Ellie bring brand new, teeny, tiny Ellen into the world! Eli & Ellie bring brand new, teeny, tiny Ellen into the world! Well, on the way to Augusta to look at this next truck, I get a picture text from Jason of what appears to be Ellie with a ......... teeny tiny solid white little baby goat kid???!!!!???? Oh my! I call him immediately and confirm that my eyes are not playing tricks on me..."Hello" - me: "Oh my god! oh my god! oh my god!! Ellie had her baby??" I am asking a million questions at the speed of light, firing one after the other, not even giving him a chance to really answer. I take a deep breath.....then calmly ask how Ellie is and if he had to help deliver the baby. He says he just walked out to the field and saw a little white spot waaaay out in the pasture - and it was Ellie and her newborn kid and she was a little doe. I texted Jason to see if he had named her. His reply: Ellen. Well, I didn't end up getting that truck either but the ride there and back was so beautiful - pecan groves and cotton fields were everywhere. We drove for an hour and didn't even see a store. It sparked my desire to one day live in a place like this. Far from the strip malls, highways, and chain restaurants. It was very quiet out here. When I got back into Athens, I desperately wanted to see Ellen but unfortunately my car is still in the shop and being repaired from that dang deer last week...... Tomorrow I am getting out to the farm even if it means renting a vehicle!